The U.S. Bureau of Labor Statistics found in a study that security guards suffered fatal workplace injuries at more than twice that of workers in general. These risks were especially prevalent at night. These guards were stationed in department stores, shopping centers, office buildings, transportation terminals, museums and more. Their injuries came from retaliation by belligerent customers, robberies, and senseless attacks. Usually they are on their own with nobody readily available to back them up. It can be a tough job, and employers should give their guards all the tools they need to succeed and stay safe. Lone Defender is a device every security guard or other lone worker should be using to ensure they are protected. It gives workers the peace of mind knowing that they can instantly request backup. Lone Defender can even make emergency calls itself when it senses distress. Employers using Lone Defender know that their workers are properly equipped, and they can also track their status through a dashboard to make sure the job site is fully protected. Lone Defender has numerous capabilities; perhaps most importantly, it has GPS technology that can rapidly provide location information. This information can be sent off to first responders if an emergency is detected. Lone Defender also includes a man down feature with an accelerometer, which allows the device to detect falls. If the device senses that the holder has fallen and not gotten back up, it will send an emergency signal. The device is also durable enough to survive almost any environment. It has a very low power consumption to ensure it will make it through any shift on a charge and can easily be updated with new software versions. The device provides a range of communication options. A quick press of a button can send a text message, but the Lone Defender can also function as a telephone. Lone Defender can easily register check-in information utilizing RFID tags staged around the work site. The device has an emergency panic button that will send an emergency signal with GPS coordinates, and it can route calls along a roll-call escalation until an emergency contact picks up the phone. 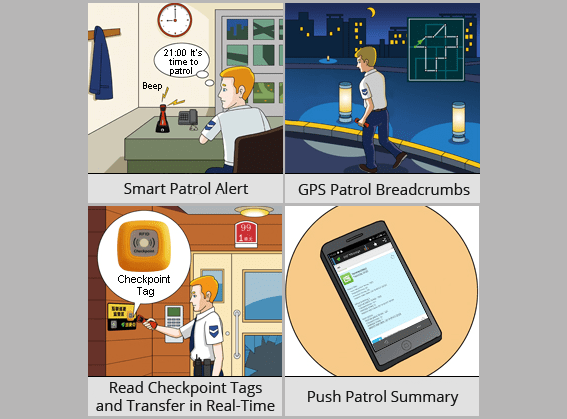 Employers get an easy-to-use interface with real-time GPS information on every worker using a Lone Defender. They can make sure workers are making their rounds by ensuring that RFID scans have been made as required. These are all displayed onto a map of the area and can be paired with a pre-set amount of time between stops to make and keep a schedule. Employers can get an instant alert if patrols are not being completed, and they can easily send requests for a call if workers do not seem to be in the right location.